Top Shark Pro is the definitive source of information for multi-table tournaments, sit and gos, and heads-up tournaments. 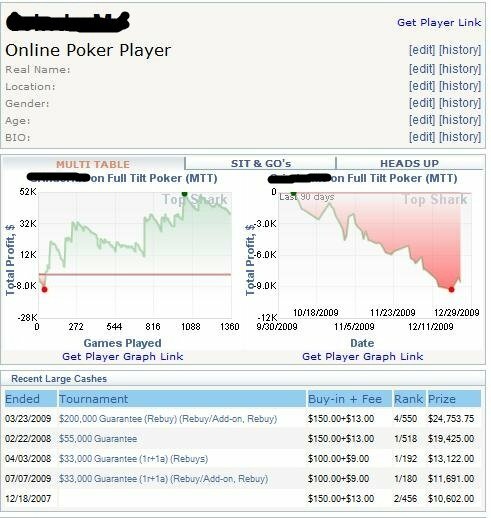 The program offers the ability to capture data from major online poker sites and report it back to you. Simply enter the name of a player to receive their vital results in a slick report. For those just trying out Top Shark, you’ll get 20 unique daily searches per day. The interface at Top Shark Pro, which is exclusively web-based, is extremely easy to figure out. Simply enter a player’s name and then pick from the drop-down menu what site they play at or just leave it on “All Poker Sites” to search them all. You can pick a date range and use other filters to adjust the reports. 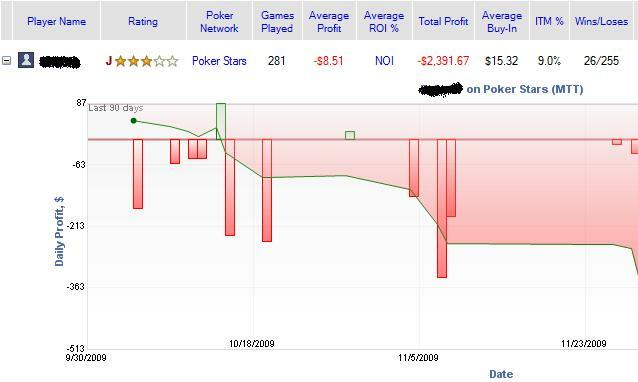 Once you’ve found a player, you’ll immediately see their star rating, number of games played, average profit, average return on investment, total profit, average buy-in, ITM%, Wins/Losses, and finish percentages. If you click on a player’s name, you are then taken to that player’s stats page. Two graphs show trending for profits. First, you’ll see the “Total Profit $ vs Games Played” graph and next to it you’ll see the “Total Profit $ vs Date” graph. Below that, you’ll see recent large cashes and another box that shows the last 10 poker tournaments played. Each one of the tournaments listed is linked to the full results page that shows when the tournament took place, the buy-in, the prize pool, and the entire list of players along with their finish position and how much money they won, if any. When you are in the main search area of Top Shark Pro, there are seven different filters you can apply to your search query with the option to save the filter for later use. The filters include a date range, game type, limit, entrants, buy-in amount, speed, and tournament name (such as Double or Nothing, Knockout, Sunday Million, Rebuys, or a customizable name of your choosing). These filters make it very easy to sift through all of the results and figure out where you (or your search subject) is making or losing the most money. You can see the results of your filters in the “Filter” row, where the player report first shows up on the search page. It should be noted that Top Shark Pro is one of the very few places where Double or Nothing tournaments are tracked. The depth of Top Shark Pro is really impressive and overall, a tremendous asset to any player that even dabbles a bit in any form of tournament poker. It’s a great way to keep track of your own results and also look up people at the tables to see if they are a fish or a shark. Overall, it’s a great investment in your game to simply take the time and dive right in. In addition, check out our review of Top Shark and don't forget that you can use Super HUD with Top Shark Pro!